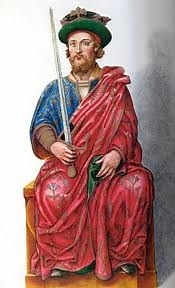 Pedro I de Bourgogne, Rei de Portugal was born in 1320 at Coimbra, SpainG.1 He was the son of Afonso IV de Bourgogne, Rei de Portugal and Beatriz de Castilla.1 He married, firstly, Blanca de Castilla in 1325 at AlfayateG. He married, secondly, Constanza de Peñafiel, daughter of Juan Manuel de Peñafiel, Duque de Villena and Constanza de Aragón, in 1339.2 He married, thirdly, Inez de Castro, daughter of Pedro Fernandez de Castro and Beatriz de Portugal, in 1345 in a secret marriage. They were remarried in an open ceremony in 1354 at Bragança. He died in 1367. His marriage to Blanca de Castilla was annulled in 1330. He succeeded as the Rei Pedro I de Portugal in 1357.2 Pedro I de Bourgogne, Rei de Portugal also went by the nick-name of Pedro 'the Cruel'. [S16] Louda and MacLagan, Lines of Succession, table 116.